Stainless Steel Vacuum Bottle, Extra Large, 1 1/2 Quarts. Bring Ice cold drinks, hot coffee, or hot chocolate anywhere, with this Double Walled 1 1/2 Quart Vacuum Bottle. Maxam 1.5qt Stainless Steel Vacuum Bottle. Add to the enjoyment of a great race, watching your favorite football team, or just taking advantage of the convenience in taking lunches to work. This Extra Large 12-1/4" tall, 1 and a half quart vacuum bottle is designed for the ultimate in convenience. The double wall construction keeps liquids cold or steaming hot. Of particular convenience is the collapsing built-in handle; this vacuum bottle easy to carry easy to hold for pouring. Built-In Handle, which also collapses out of the way, for utmost convenience when carrying or pouring. Also comes with a separate nylon carrying strap, for easy portability. The top is a cup, and it also comes with a white cup, which easily stores inside the top! 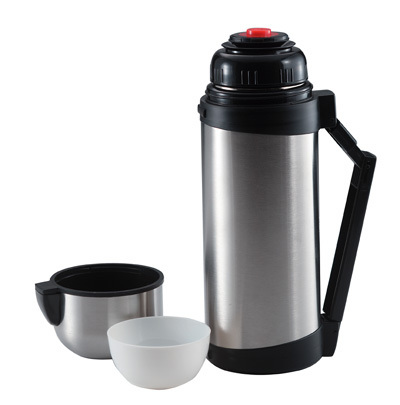 Because of the superior double wall construction, this vacuum bottle keeps coffee, tea, soup, or any other hot liquid, HOT for hours on end. Also keeps cold drinks COLD for hours on end! Great for bringing to work, football games, camping, fishing, hunting, or anywhere else. Also comes with a Manufacturer's Lifetime Warranty! Gift Boxed, in a nice sturdy white gift box.